We have featured quite a few different iPhone accessories here at Geeky Gadgets, including a few different iPhone speakers, the latest one is certainly unique, the Arkcanary II iPhone speaker. As you can see from the photo below, the Arkcanary II iPhone Speaker features a similar design to a gramophone, and it amplifies the sound coming from your iPhone speaker. 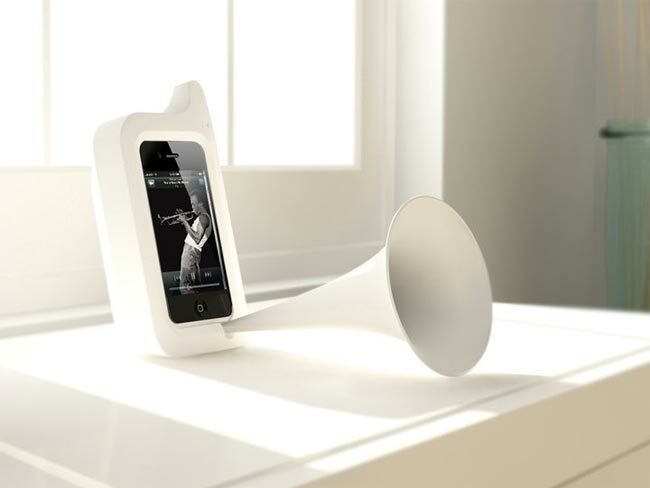 ARKCANARY II is an analog acoustic speaker for the iPhone 4. This speaker amplifies existing iPhone 4 speaker. Much like our successful ARKHIPPO I standing iPhone 4 cover, users simply slide an iPhone 4 into the ARKCANRY II for use. The Arkcanary II iPhone Speaker is currently listed over at Kickstarter, and if the company producing it gets enough support the speaker will go into production and should retail for around $13.00.